All names registered on our pyramid will be placed on a piece of paper that will be folded into an origami Peace Dove and taken with us into Giza Pyramid on 11/11/11 to move through the Portal of Christ Consciousness offered to us on this Day. Please register on the comment section and you will be included for this amazing Healing process. 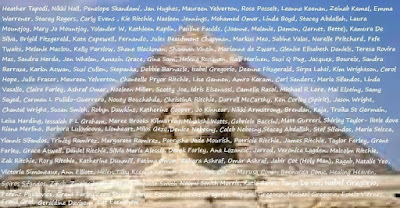 Click on the photo for an enlarged version if you can't read your name. My gift to you is a meditation holding Sound Keys and Codes of Light that will assist you to make the shifts that are needed for the upcoming portals of the New Dawn into 2012 and beyond. Please register before the 8th of November so you can travel on the complete Ascension Journey with us. The Photo will be kept updated and you can copy and save the final photo for your evelasting memory of this day. Download the link and save to your computer and use prior to the day for preparation, on the day to enter the portals and after to continue the healing process and support your own journey.